A review by Marion Drew for EXTRA! EXTRA! On a crisp evening not long before Christmas, if you should venture out into London’s West End, don’t be surprised to find a little magic waiting just around the corner of Portugal Street. An endearingly klutzy snowman and an impish little boy might invite you along on a snowy adventure to places near and far, and you’d be a fool not to go. Who knows who you might meet on this magical starry night? a funny pair of parents; a delicate ice-princess all gossamer and spangles with a wicked Jack Frost who wishes to steal her away; and all manner of animals from a fussy fireside cat to shy woodland creatures and even Santa’s reindeer! You might get to ride an old motorbike, attend a snowman party, even dance with one from Switzerland, and get your gift from Santa himself. 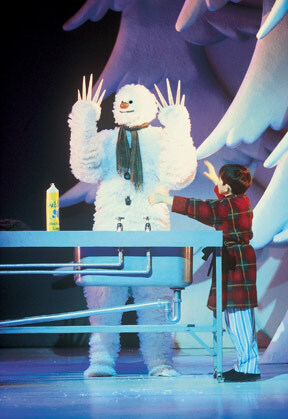 This production, which keeps gratifyingly close to the original Raymond Briggs’ timeless story, is indeed a gift. 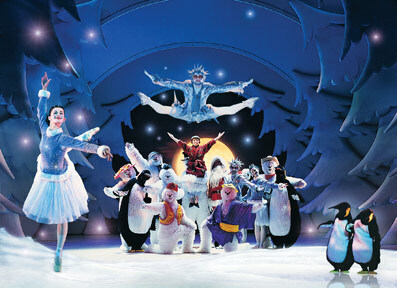 Delightfully wrapped in clear, crisp choreography, laid out on a gorgeously lit, snowy stage with simple and evocative sets that could have come straight out of Dr. Seuss, and run at a pace that beautifully accommodates little concentration spans, it is enchantment from beginning to end. There is something for everyone; a simple but engaging adventure; tutus and toe shoes enough to fill every little girl’s heart to over-brimming; and a gentle, subtle humour for the grown-ups in the audience. The music works its magic as well; Howard Blake’s beautiful richly layered score is presented with a passion that is the wind beneath the wings of this production. And fly we did. When James and the snowman floated up and away, there wasn’t a heart in the audience, young and not-so-young, that didn’t lift with them. And when the snowman sets you back down in London again, and melts away taking your childhood with him, you might nevertheless, like James finding his snowman scarf in the pocket of his dressing gown, have found something warm and sweet in this little musical adventure that you can take away with you. Groups 8+ 20% off stalls seats for most performances.